15 May 2018–Nyiragongo in the Democratic Republic of the Congo is among the world’s most active volcanoes, with a persistent lava lake as one of its defining features. In a talk at the 2018 SSA Annual Meeting, Adrien Oth of the European Center for Geodynamics and Seismology discussed how he and his colleagues are using multiple methods to monitor lava lake levels at the volcano. 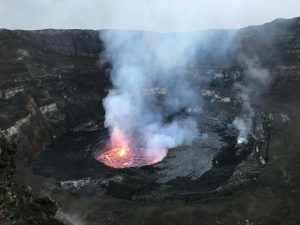 The researchers analyze seismic and infrasound signals generated by the volcano as well as data collected during satellite flyovers to measure Nyiragongo’s lake level fluctuations. During the eruption in 2002, which caused a major humanitarian crisis, the lava lake was drained and the depth of the remaining crater was estimated between 600 and 800 meters. About four months after the eruption, the crater started filling up again. Nowadays, the inner crater floor is about 400 meters below the rim and the lava lake remains at high level. In combination with seismic and infrasound data, the scientists are using high resolution synthetic-aperture radar (SAR) images captured by satellites passing over the volcano to directly measure the rise and fall of the lava lake level. These images measure the length of the shadow cast by the crater’s edge on the lava lake surface, which can be used to calculate the lava depth.